Nope. That funny-sounding word is all about horses, not hippos. Hippos is the Greek word for horse, so Hippotherapy quite literally translates to “horse therapy”—a highly effective rehabilitative treatment for children and young adults with physical, sensory, and cognitive challenges. Hippotherapy is conducted by board certified, licensed therapists, trained to use a horse as a treatment strategy for Physical (PT), Occupational (OT), or Speech Therapy (SLP). It is in high demand because of its outcomes; yet Hippotherapy is not widely available or accessible around the country. And it is often unaffordable for most families. 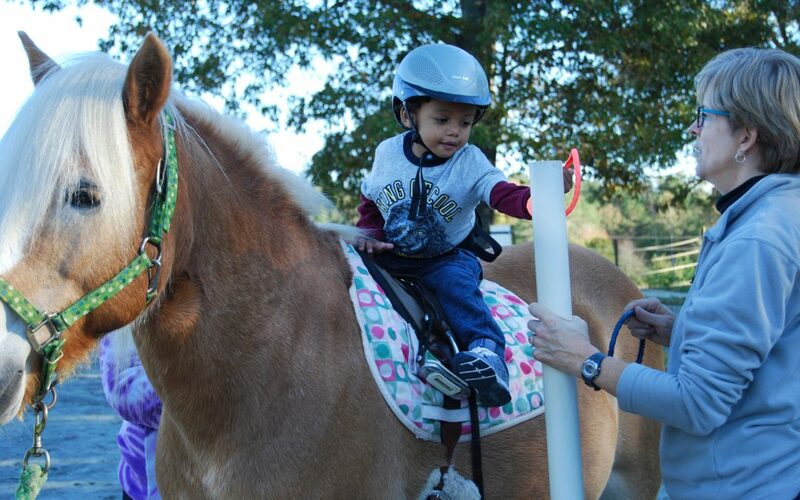 Shining Hope Farms is the only facility specializing in Hippotherapy in the Charlotte metro area. We receive calls virtually every day from families wanting to enroll their child (or sometimes children) into the program. Programs like ours are so scarce that some families travel hours round-trip to attend their child’s weekly session. Shining Hope Farms exists to make this special therapy available to as many families as possible, regardless of their means to pay. Unlike other Hippotherapy programs around the country, we do not charge an “equine fee” for the use of the horse in therapy. We bill the insurance, just as a regular outpatient clinic would do, so there is no out of pocket cost for our patients with Medicaid (the majority of our patients). The fact that we take insurance and do this on behalf of the families is unusual in the field of Hippotherapy. We do it because our mission is to make our programs financially accessible for any family. Caring for a child with special needs is expensive in the best of circumstances, and a good portion of the families we see are already in poverty. In 2017 we served 143 patients over thousands of hours. The outcomes are just astounding. The horse is a treatment tool like none other. While we have, and use, a clinic in conjunction with the horse, clinic therapies often require going from one machine or activity to another to target different outcomes. The horse, however, is capable of helping a child work on many things simultaneously. Much of our treatments’ success lies in a combination of motivational and physical factors: The horse and farm-rich surroundings provide a highly motivating environment for treatment (unlike the clinic settings our patients are used to). The spine-on-spine interaction of the horse and child stimulates memory and concentration and the horse’s 3-dimensional movement helps tremendously with balance, flexibility, and core strength. In fact, that movement actually mimics the human walking (or gait) pattern more than anything else natural or man-made. So, amazingly, our patients (and their muscles) learn this normal pattern just by straddling the horse. The direct impact of Hippotherapy on the patient is immense. Patients build strength, life skills, and independence through physical, emotional, social, and cognitive gains. However the impact extends even further—they are better able to interact with their peers and families and become more productive citizens in the community. This benefits their families, neighborhoods, and schools and contributes to a stronger healthier community overall. We love that our patients are excited to come to the farm, and that it’s often the highlight of their week, especially because many don’t even think of it as therapy. They’re often focused on going to see “their horse” rather than on the hard work that they have to do. A mom of a child who is nonverbal and has limited mobility told us recently that her little one kicks off the covers on the mornings where she knows she has her session. Another told us that their child puts on their boots hours before it’s time to come out. It’s this kind of enthusiasm that motivates our participants to do the hard work that leads to great outcomes and is why the farm can often be a place of breakthrough for a child who isn’t responding to other treatments or who is burned out by traditional therapy. When you’re working with this population, it’s hard to argue with something that yields such incredible results, brings so much joy, and creates so much shining hope. This is what motivates us every day.